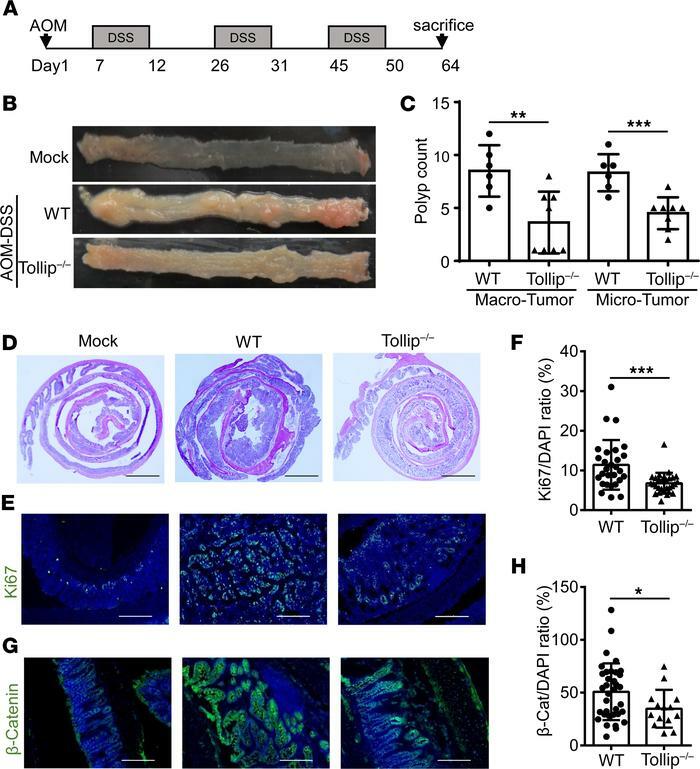 Tollip deficiency decreased tumorigenesis in the AOM-DSS mouse model of colorectal cancer. (A) Schematic protocol of AOM-DSS treatment. (B) Representative images of colons from WT and Tollip–/– mice treated with AOM-DSS or naive mice. (C) Graphical representation of tumor burden in WT (n = 6) and Tollip–/– (n = 8) mice. Tumors with diameters greater than or equal to 2 mm were defined as “macro” tumors; those with diameters less than 2 mm were defined as “micro” tumors. (D) H&E-stained sections of colon from WT or Tollip–/– mice treated with AOM-DSS or naive mice. Colons were collected in Swiss rolls at the end of the AOM-DSS regimen. Scale bars: 2 mm. (E) Immunofluorescence analysis of Ki67 in colons of from WT or Tollip–/– mice treated with AOM-DSS or naive mice. Scale bars: 200 μm. (F) Quantitative analysis of Ki67 staining. (G) Immunofluorescence analysis of active β-catenin in colons from WT or Tollip–/– mice treated with AOM-DSS or naive mice. Scale bars: 200 μm. (H) Quantitative analysis of active β-catenin staining. Statistical significance was determined by 1-way ANOVA followed by Tukey’s post hoc comparisons (C) or Mann-Whitney U test (F and H). *P < 0.05, **P < 0.01, ***P < 0.001.